Want to Visit This Business? Click this link and get started! Great opportunity to immediately get into a newly built out restaurant. Located in a super busy shopping center with many high traffic turn tenants, potential new customers are rolling through this center constantly. Save big on time and build out costs, this place is ready now. Keep the same successful Pho style growing concept or bring your own concept, Mexican, Mediterranean, Deli you name it. To change concepts, it could be as simple as a menu board change out on the their three 60” TV’s, putting up new sign outside and you are up and running! Current Asian concept has been increasing sales every month for each of the last six months. Seller has family issues and can no longer dedicate time needed to properly run this restaurant. August sales were 14k, September sales were 15k. All in rent is only $2,205/ month which includes NNN, trash and water. Restaurant space is 900 square feet. Current lease term expires 12/31/2022 with a five-year option available. The kitchen has all new equipment and literally sparkles. It’s all brand new here. 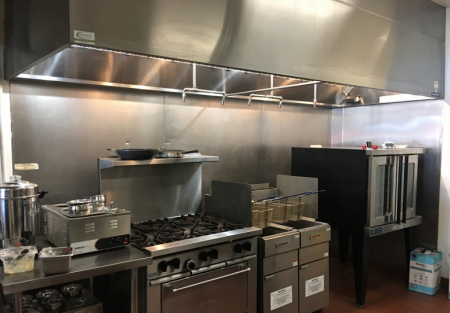 Restaurant kitchen includes a 12-foot hood system, a cold prep table, two deep fryers, a six-burner commercial stove and oven, a Duke commercial oven and stand up freezers and refrigerators. There is a Clover POS system in place along with a video security system allowing for easy access to what is happening at your restaurant. If you are looking for a San Diego restaurant in pristine condition that is, with super low cost of occupancy, this is a must-see location.